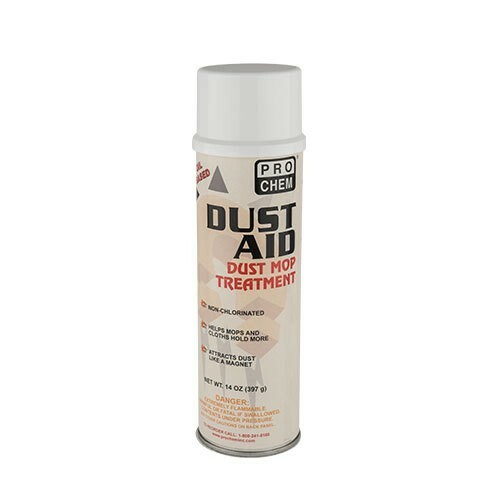 Dust Aid | Pro Chem, Inc.
DUST AID is an oil-based treatment, which quickly attracts dust and dirt to mops, cloths, and mitts, allowing mops and cloths to hold more dirt, thus eliminating dust particles from floating through the air. DUST AID brightens and adds protection to dusted surfaces. This pleasantly scented spray acts like a magnet to attract dust and lint to the mop or cloth, then converts dust into heavy lint so to eliminate flying dust, resettling, or inhalation. Areas of use include tile, linoleum, marble, furniture, terrazzo and wood flooring, window frames and sills, countertops, Venetian blinds, and gym floors. Spray a light mist directly on mop. Allow treatment to penetrate. Dust as usual. Reapply as needed. When saturated, shake out lint and clean mop, cloth or mitt in washing machine. Repeat treatment.